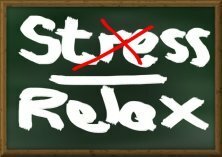 Stress - What is it? Different types of stress are often lumped together. When actually it can be divided into at least three groups. And it is not always a bad thing. It all has to do with when you're having it and how your body responds to it. People with MS, have to learn to deal with it in a way that's different than most people. With that said, what exactly is it? First of all, this type, sudden acute, is just that. It happens quickly and is very intense or severe. Examples of this would be a car accident or a house fire. I even found out that here have been studies done on the effect a missile attack has on MS.
You would think this would be devastating for people with multiple sclerosis. Fortunately, things like the examples above don't actually cause MS. They also don't make a person with MS have a relapse. This first type happens quickly and is usually over with pretty quickly. Even though the effects of it may last awhile, it doesn't pose a threat for MSers. A sudden crisis, however, like the death of a child can raise your risk of developing MS. Because this type is closer to you, emotionally it will stay with you longer. And it could cause you to develop MS. The second type is an on going, chronic type. Do you worry about your finances? Is your marriage suffering? Are you dealing with a rebellious teen? These are situations that can cause relapses. By eliminating the problem, you can lessen the number of relapses you may experience as a result. The third type is the everyday kind. Are you constantly stuck in traffic? Are you always loosing your car keys? Do your kids drive you crazy with their bickering? How do you deal with it? As with most everything, we're all different in the way we handle it? Even our individual levels are different. What causes you apprehension may be taken in stride by someone else. How do you know when it's becoming an issue? And once you know, what do you do about it? Head over here to read about the signs of stress. Here is where you can go to read about how to identify what specifically causes you anxiety. And here's a great site for helping you learn how to deal with it - Strictly Stress Management. Follow this link to find out What Causes MS.